The company's mission is simple: We pride ourselves to strive for excellence in all our services: always caring and serving our clients best interest first. The core of our company focus is always be innovative, creative and more importantly value long lasting relationships with all our clients. The foundation of Green Jungle is being a true green company, returning tons of green, plastic and paper back to Mother Earth. "After years of experience, I have learned the trick of making plants “pop” – creating the ideal harmony between nature and architecture. I pride myself in my ability to find the perfect balance... only placing a plant where it presence enhances the aesthetics of the surrounding area – never placing a plant just to fill an awkward space. 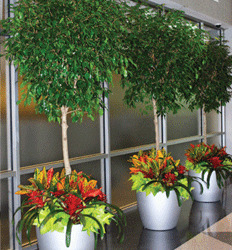 That being said, within a few minutes I can determine which plants will best complement your office building and where each is best suited to survive. I personally guarantee that I will never allow a bromeliad to lose it’s color, an orchid to wit, nor a dracaena to drop its leaves. In fact, I guarantee that all plants are in excellent health at all times. No matter the size of your company, I would like to save your money and at the same time enhance your service. In fact, because I know how grossly overpriced my competition is… I guarantee that I can save you 20% off what you currently pay. "